In fact, some denizens of that era never moved to Facebook. Painter Dennis Hollingsworth, am happy to see, is still maintaining an open studio on his Movable Type blog. How he is able to do this with no verifiable friend count is hard to fathom -- he must be crushingly lonely. Almost like painters were before the internet. John Seed's article about the above painter uses two words that should cause shivers to anyone who has read a word or two about Facebook's celebrated collusion with government and advertisers: trust ("the sense of trust this [transparency] engenders" "his candor generates trust") and confessions ("Mark’s Facebook posts strike me as brave and honest confessions around the challenges faced by the painter on a daily basis" "Facebook offers a public forum where doubts and confessions can be offered up and support can be offered"). Its true that "talking about some of the melancholy [you] go through in the studio" isn't the same as admitting a crime or peccadillo that John Law or Jane Employer might find intriguing. But post-Snowden, et al, this is probably a better time to be putting on your game face than letting it all hang out. One should be wary of "confession creep." 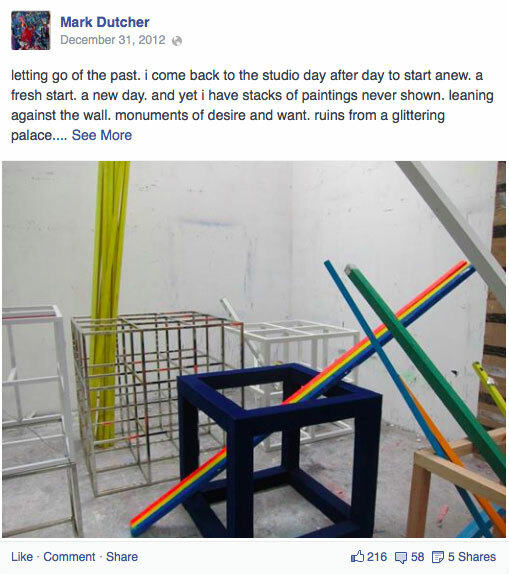 Hyperallergic won't do this -- its ongoing mission is to make Facebook cool for artists. But others might note the example of how not to be, on the internet, at this particular moment. Your vulnerabilities can and will be used against you.